VOLTAGE REGULATOR, FOR AUTO-LITE, GENERATOR, 6-VOLT. VOLTAGE REGULATOR, FOR AUTO-LITE, GENERATOR, 6-VOLT, 35 AMP. VOLTAGE REGULATOR, FOR AUTO-LITE, GENERATOR, 12-VOLT, 35 AMP. VOLTAGE REGULATOR, FOR AUTO-LITE, GENERATOR, 6-VOLT, 46 AMP. VOLTAGE REGULATOR, FOR DELCO-REMY, GENERATOR, 6-VOLT, 45 AMP. VOLTAGE REGULATOR, FOR DELCO-REMY, GENERATOR, 12-VOLT, 25 AMP. VOLTAGE REGULATOR, ALTERNATOR, SOLID STATE, 12-VOLT, FOR USE WITH MOTOROLA ALTERNATOR. VOLTAGE REGULATOR, GENERATOR, SOLID STATE, 24-VOLT. NOTE- FOR CORRECT CHARGING, REGULATORS AND GENERATORS MUST BE FROM THE SAME MANUFACTURERS. VOLTAGE REGULATOR, FOR AUTO-LITE GENERATOR, 6-VOLT, PRESTOLITE BRAND, MODEL VBO-4601 C.
VOLTAGE REGULATOR, FOR AUTO-LITE GENERATOR, 12-VOLT, DELCO-REMY BRAND. VOLTAGE REGULATOR, FOR AUTO-LITE GENERATOR, 12-VOLT, ECHLIN BRAND. VOLTAGE REGULATOR, FOR AUTO-LITE GENERATOR,12-VOLT, PRESTOLITE BRAND MODEL VB-6201A. NOTE-WILLYS JEEP PARTS OFFERS MORE OEM WILLYS PARTS THAN ANYONE-ANYWHERE! This is a Department of the Army Technical Manual dated November 1952, 396 pages, 6" x 9", soft cardstock covers, three hole punched and shrink wrapped. 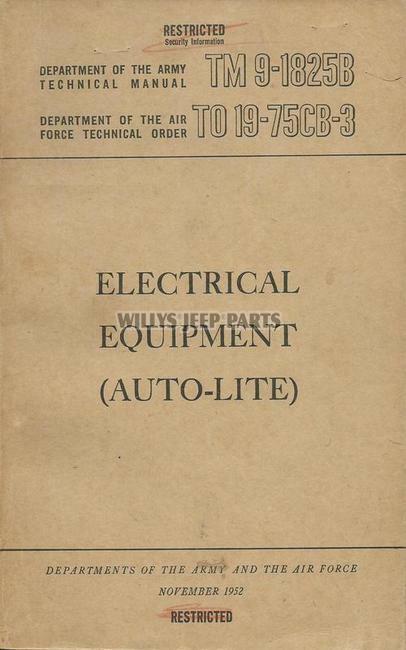 This manual covers the description of and procedures for the disassembly, inspection, repair, rebuild, and assembly of Auto-Lite voltage regulators as used on all Willys Jeep vehicles from 1941 through 1952. 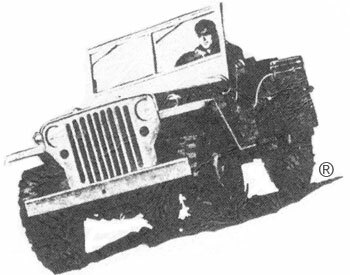 Many of these items were installed on Jeep vehicles though 1968. This manual should be used in conjunction with the information contained in the pertinent vehicle operator's manuals and service manuals. TM 9-1825B is the most detailed and informative publication available for the early voltage regulator maintenance that we have seen to date. CAUTION! Maintenance and service on Willys electrical systems should only be accomplished by qualified mechanics using the appropriate manuals. Voltage levels, particularly within the ignition system can be hazardous to other electrical components.In accordance with accepted automotive industry standards we do not offer refunds or exchanges on any electrical parts other than core exchanges on rebuildable generators, starters and distributors. Copyright 2005-2018 WILLYS JEEP PARTS LLC. All rights reserved.